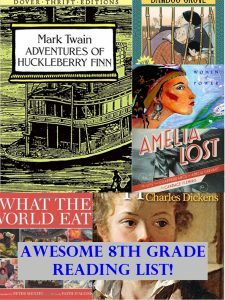 Looking for an 8th grade reading list? Here is a recommended reading list for you. We found some excellent biographies, classic books and short stories that are ideal for a middle school student. They may just spark a love of great literature! Whether you are looking to supplement your child’s learning or for a great summer reading list, simply click on the story link for a complete description and reviews from Amazon if you want to learn more. Why provide your student with supplemental reading? The reasons are numerous! Since 8th graders find themselves on the cusp of so much change, the 8th-grade year can often be a time of tremendous stress. Reading has been shown to actually decrease stress! Our selection of books for 8th graders is designed with students emotional needs in mind as well as their academic needs. Think of books as stress relievers. They give the mind a very specific place to go, and readers can immerse themselves in the flow of a fictional story or nonfictional narrative. When one is engaged in a fascinating book, all the concerns of school life that might plague a student’s mind fall away and are replaced by the magic of storytelling. By 8th grade, students have hopefully built up a very usable level of vocabulary. For 8th-grade level reading literature, special care is taken to ensure that students are continuing to elevate their vocabulary and increase their understanding of myriad words and concepts. This has some effects that go well beyond students choosing a more elevated language for their writing. People who are more articulate and are often regarded as more intelligent. Studies have shown that people who use a wider variety of language are more likely to receive promotions during their careers than people who have a limited vocabulary. Vocabulary isn’t the only database in which reading contributes. In 8th Grade, we like to give our students a selection of informational books. Becoming knowledgeable in a wide variety of fields increases a student’s ability to make educated decisions as well as lending them the aptitude to engage in conversations on a variety of topics. Although having in-depth knowledge is valuable in areas of concentrated learning, having a broad base general knowledge is useful in many aspects of a student’s life. Read to Stimulate the Mind! Reading has been shown to stimulate the mind in ways that watching TV and playing video games simply does not. Furthermore, longer reading sessions with narrative structures and a cast of characters help strengthen one’s mental capacity. 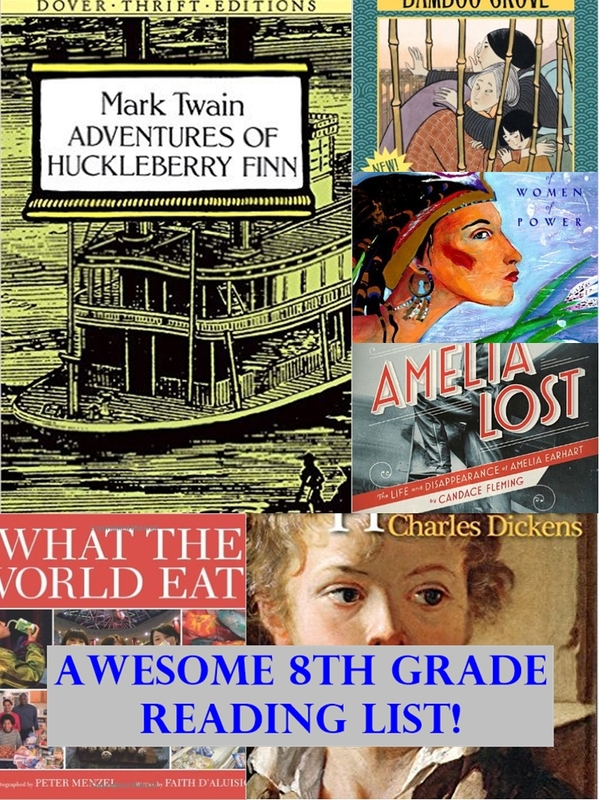 We suggest a broad array of topics for 8th-grade reading because many students are still discovering what areas of interest fascinate them the most. You never know what might stimulate a child’s mind most until they’ve read about it! Reading actively improves one’s memory! Because fiction and nonfiction are both inherently complex things that involve multiple plot lines and details that must be kept in mind for quick recall, reading a book serves as an excellent gymnasium for strengthening the mind. Like muscles, one’s memory deteriorates without use. People who use memory and recall more frequently have a stronger capacity for recall in all aspects of their life. Some of the best ways to increase one’s ability to remember important details include reading and discussing books. Read to Develop Analytical Thinking! Reading also develops analytical thinking. When one reads, one is passing the thoughts of another human being through one’s mind. Although lower-level readers will tend to accept all the content that they are engaging as truth, more advanced readers will begin to notice a separation between one’s own beliefs and the beliefs being presented in the work. Using writing exercises to articulate the differences and perspectives, be they between the author and the reader or the author and another author, is an excellent way to flex and develop critical thinking skills. Read to Increase Concentration and Focus! In today’s world, we find ourselves bombarded with information. Students have become especially adept at multitasking. Although multitasking is an excellent ability to master, there are weaknesses to having a distractible mind. Reading helps practice the lost art of focus. Engaging fiction or nonfiction involves putting aside all distractions and paying attention only to the words on the page for an extended period of time. Nowadays, students are used to following Twitter, updating their Facebook, listening to music, watching television, and browsing the internet all more or less simultaneously. Reading remains an activity that demands one’s full attention. In an environment where concentration is a rare ability, having the skill to be able to fully engage a single task is becoming increasingly invaluable. Read to Become a Better Writer! Reading also makes students better writer! When students read, they are passing through their minds well edited and carefully considered sentences. These are no longer words that would accurately describe the bulk of content that most people read on a daily basis! Facebook statuses, tweets, and popular online magazine articles tend to be far less thoughtful and meaningful. In the same way that musicians listen to copious amounts of music and are able to cite artists who have influenced their work, so too are writers able to point to which works of fiction most influenced their writing style and their own voice. Although it’s all well and good to practice writing on its own, analyzing the aspects of literature that make a particular piece of writing so effective is an incredibly efficient way to improve one’s writing ability. That’s why we always encourage writing activities to be used in conjunction with reading assignments. Click on the story link for a complete description and books reviews if you want to learn more. If you haven’t read them yet yourself, we bet that you will love reading them too!